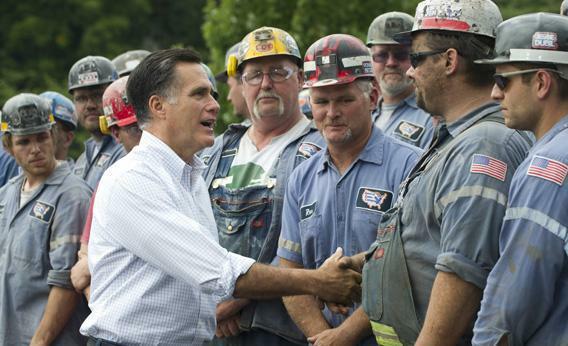 Mitt Romney coal jobs: Romney talks about jobs, but the coal industry is dying. The GOP candidate’s distortions, flip-flops, and bad jokes about energy. By now we know that Paul Ryan has more or less declared himself to be a full-blown climate change denialist. But what are we to make of Mitt Romney? Perhaps we should call him a Climate Clown, since he seems to think global climate catastrophes are a laughing matter. Romney used the bully pulpit of his acceptance speech at the Republican National Convention to ridicule President Obama’s aspiration that the Obama administration might someday be seen as a turning point in the effort to combat global warming. Alas, it is an aspiration that has not been fulfilled (not yet, anyway), but it was a good aspiration to have, not something to ridicule, still less to ridicule by implying that halting global climate catastrophe would do nothing to help American families. Last time I checked, America was part of the globe, so if the globe warms, America warms with it, and every ton of carbon dioxide America adds to the atmosphere adds to the collective warming we all suffer. There is indeed a serious issue lurking in the joke, regarding the crucial task of how to engage China in joint efforts at emission reductions. Surely a necessary part of that is showing that America is willing to do its share, especially given that America still bears a far greater responsibility for the amount of carbon dioxide accumulated in the atmosphere than does China. But Romney isn’t interested in such things, and he offers no path forward for engaging China. He is only interested in using Chinese emissions as a bludgeon to kill off any efforts toward reducing U.S. emissions. Why think seriously about how to address an important problem like this when you can just dismiss it with a joke? Actually, it is Romney who is manipulating technical data here. In doing the mandated cost-benefit analysis of the regulation, the EPA did not attempt to evaluate the monetary value of most of the health benefits of reducing mercury emissions, because other benefits of the regulation were easier to quantify and already amply justified the costs. In essence, this allowed the EPA to avoid trying to answer absurd questions like “How much should we pay you in order to allow this power company to drop your kid’s IQ?” Mercury does not itself contribute to climate change, but the issue of mercury emissions and carbon emissions are coupled, because mercury emissions controls force coal users to bear more of the true environmental costs of their activities, and thus favor cleaner (and less carbon-emitting) energy technologies. That sounds pretty reasonable. A few lines further down, he muddies the waters by distorting the extent and nature of scientific disagreement regarding global warming. Still, on the spectrum of people looking for excuses to not do anything (much) about the problem, he’d qualify as at least a lukewarmist. But scroll a bit further down to the answers on energy policy, and you find that to Romney, an “all of the above” energy policy basically means: Let’s get all of those fossil fuels above ground, and do it as fast as possible. Five points of the six-point energy plan that Romney touts in the Science Debate answers deal almost exclusively with increasing fossil fuel production. The only sop to anything else is a vague statement regarding more government-funded basic research in energy technology, though how he will do that while cutting taxes and increasing military spending is anybody’s guess. For him it’s a dream. For us, it’s a nightmare. Romney has repeatedly accused Obama of implementing environmental policies that have killed off coal production and coal jobs. In reality, coal production in the United States has been fairly flat since 1989, a period that has included Republican and Democratic administrations. In recent years, the lack of growth in demand for coal almost certainly has more to do with competition from cheap, hydrofracked natural gas, which is also the main factor (together with the sluggish economy) for the moderation in growth of U.S. carbon-dioxide emissions. From all of Romney’s weepy concern about the jobs of coal miners, you’d think that coal mining was a major engine of American job creation. In fact, coal-mining jobs have been in steady decline for decades. In 1920, coal mining accounted for 1.3 percent of the U.S. labor force. It declined steadily to under .06 percent of the labor force by 2008, largely because of technology—one guy can move a whole lot of coal by ripping into a strip mine with a giant scoop or scraping off the top of a mountain in a mountain-top-removal mine. These are the very technologies, environmentally destructive though they are, that free market forces have favored. Any substantial increase in coal mining jobs would require substantial interference in the free markets Romney professes to love—including somehow subsidizing coal so it could compete with currently cheap natural gas. To put those jobs numbers in perspective, there are around 83,000 people employed in coal mining today. You could roughly double that if you added in people employed in transporting coal and burning it in power plants, but those people would be equally well-employed if they were transporting other energy-related products, and power plants will employ people regardless of what fuel is used to produce the power. By way of comparison, there are currently 647,200 people employed driving buses, and the number is projected to increase by 83,000 by the year 2020—an amount equal to the total employed in coal mining. For that matter, the number of hairdressing jobs is projected to increase by more than 100,000 in the same time frame. A growing economy investing in the energy and efficiency technologies of the 21st century could easily absorb all of the employment in coal mining many times over, and provide jobs where people are not in daily danger of mine disasters. Romney may look like he’s weeping for the miners, but it’s really the profits of the Massey Energys and the Koch brothers of the world that he holds near and dear. President Obama’s progress on climate change during his first term has been disappointing, and even he has been all too quick to defend his record with disingenuous statements about what he has done for the coal industry. His environmental policies cannot be blamed for the continued stagnation of U.S. coal production, but the fact is that if we are going to really come to grips with the climate problem, coal production will need to start going down, with the lost energy being offset by efficiency measures and low-carbon energy production. Nonetheless, Obama’s accomplishments have been real and substantive, including appointing first-rate scientists to advisory positions, supporting EPA regulation of power plant emissions, crafting improved automobile efficiency regulations, backing more energy-efficient transport systems, and fostering the renewable-energy industry. With his greater recognition of the urgency of the climate problem and his greater experience in foreign policy, he is better placed than Romney to take on the formidable task of engaging China and India in cooperative efforts at emissions reductions. As expanded natural gas supplies continue to cut into domestic demand for U.S. coal, the next big fight will be over vastly expanded coal exports to Asia, and it will make the fight over the Keystone XL pipeline look like a minor skirmish. I know who I want on my side in that fight, and it is not the coal industry’s dream candidate.